← Global Vs. Local Perspective. The Difficulties In Helping People Understand Climate Change. My wife likes to alter her science student's misconceptions about what a "scientist" is, and teaches them that anyone can be a scientist! This is especially true for her female students - many of whom never thought about a career in science. Feb. 11th was International Day of Women and Girls in Science, and it was trending hard on Twitter; it was great to see all the different organizations honoring their female scientists! Saturn and Venus are low, Jupiter and the star Antares are high(ish) in the southeastern predawn sky; Venus continues to move down towards Saturn on the horizon. Saturn, Venus, Jupiter and the star Antares in the southeastern predawn sky. Credit: Stellarium / Bob Trembley. South-southwestern sky on Feb. 12th. Credit: Stellarium / Bob Trembley. Mars will be less then a degree from Uranus on Feb. 12th,! I expect to post images about this next week. Mars and Uranus will be less than 1 degree apart on Feb. 12th high in the southwestern sky. Credit: Stellarium / Bob Trembley. On the evening of Feb. 13th, the Moon will be about 2 degrees from the star Arcturus. The Moon and the star Arcturus will be about 2 degrees apart on Feb. 13th -high in the southern sky. Credit: Stellarium / Bob Trembley. Bob Trembley with his 40mm PST at New Baltimore Burke Park 8/12/2012, Image credit: Bob (I didn't catch his last name) with his antique film camera. Members of the public who have seen a prominence on the Sun through my solar telescope are always amazed; it has been my experience the most people don't give the Sun a second thought. "Is it sunny out?" seems to be their only concern. It's not hard to understand why... unlike everything else in the sky, you can't (well, shouldn't) look directly at the Sun with your unaided eyes, and coverage of the Sun in school science texts tends to be... well... a little less thorough than I'd like to see. This is why I lecture about the Sun, it's an amazingly complex celestial object - beautiful, and sometimes terrifying! The video below is of me giving my Sun lecture to the Warren Astronomical Society in 2017. NASA's Living With a Star program provides missions to improve our understanding of how and why the Sun varies, how the Earth and Solar System respond, and how the variability and response affects humanity in Space and on Earth. One of those spacecraft is the The Solar Dynamics Observatory (SDO) - in Earth orbit, continually watching the Sun in multiple frequencies. The SDO website has a huge image gallery, and has a page showing near real-time images of the Sun. I use SDO images and animations in every one of these posts. The Sun Now - from the Solar Dynamics Observatory website. The Moon will be at first quarter on Feb. 12th. - visible high in the southern sky in early evening, it should be a great observing target this week. The rest of the week, the Moon will be a waxing gibbous, visible to the southeast in early evening, and up for most of the night. The Moon from Feb. 12-18, 2019. Visualizations by Ernie Wright. The Sun has been spot-free for 12 days; coronal holes appear at both northern and southern poles - the southern pole is enormous! 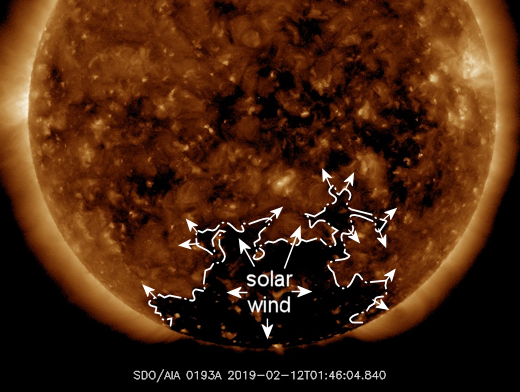 SpaceWeather.com says: "Solar wind flowing from a south polar hole in the sun's atmosphere might graze Earth's magnetic field on Feb. 13th or 14th. If so, Arctic sky watchers will get a nice Valentine's gift from the heavens as geomagnetic unrest sparks auroras--possibly pink." Some prominence activity over the last couple days - the left edge has some nice loop activity. The solar wind speed is 393.4 km/sec (⭡), with a density of 7.1 protons/cm3 (⭡). On Feb. 11, 2019, the NASA All Sky Fireball Network reported 4 fireballs. And THIS - she missed it! Position of the planets in the inner solar system, Feb. 11, 2019. Credit: NASA Eyes on the Solar System / Bob Trembley. Position of the planets in the middle solar system, Feb. 11, 2019. Credit: NASA Eyes on the Solar System / Bob Trembley. Position of the planets in the outer solar system, Feb. 11, 2019, highlighting 2014 MU69. Credit: NASA Eyes on the Solar System / Bob Trembley. At this point in my journey #ToBennuAndBack, I've traveled about 2.2 billion kilometers (1.4 billion miles) around the Solar System and will remain in orbit around asteroid Bennu until later this month. 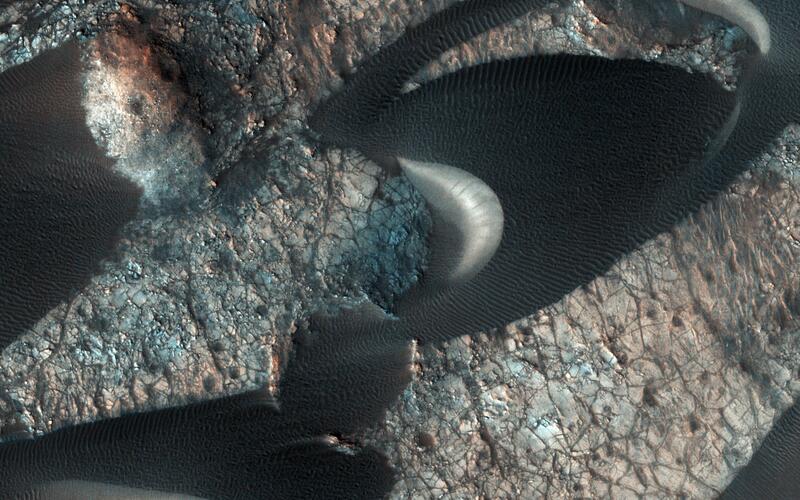 This image should be categorized as "Mars as Art." It'll be interesting to watch N6946-BH1 to see if it shows signs of the black-hole feeding.